David Beckham’s recent Instagram picture has caused a bit of backlash in the comment section, and I can well and truly say that the PC brigade has returned in full force – because their reasons for kicking off are absolutely ridiculous, in my opinion. Here’s the offending picture. Can you see any reason for trolls to have an absolute field day? Well yes, of course – it’s because he has the AUDACITY to kiss his 7-year-old daughter Harper lightly on the lips. 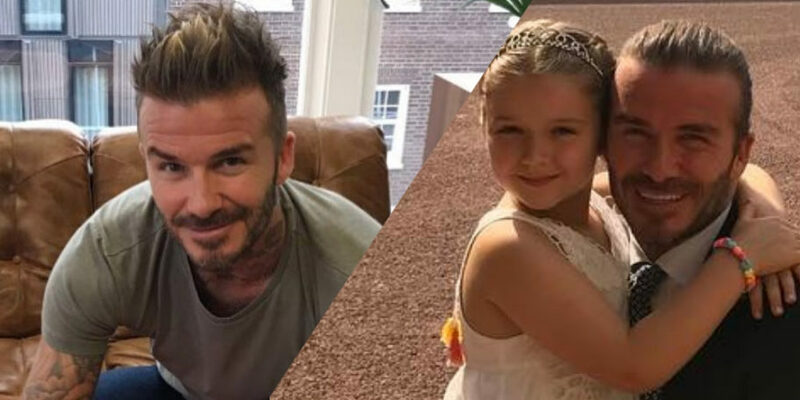 I mean, he is her father and everything and it’s quite nice to see a father actually bother to spend time with his daughter but it’s still managed to cause an absolute fuss on social media – and so much that fans of the Beckham’s have been defending the former footballer against the online trolls. Another posted: ‘she’s your daughter. .why are you kissing on her lips..?..that’s ur wife kiss…’, while a third wrote, ‘I feel like a kiss on the cheek is better than that n the lips. The lips is just weird’. He’s not exactly got hold of her head in an appropriate way now, has he? It’s a light little peck between a father and a daughter, but my lord you have to worry about just how far 2018 has gone if a father can’t kiss his own child without it seeming ‘inappropriate’. Thankfully, droves of people felt the same sentiment as myself in the comment section, and proceeded to defend David against those who were saying it was wrong to kiss Harper. While another commented:’There is nothing wrong, if you think there is then go get some help because you have mental health issues, seriously ❤’. ‘I hope you have a big delete button for all the haters on here. Honestly folks go get a life,’ a third angry fan commented. A fourth stated: “This is sooo beautiful and sweet. I am almost 30 and usually kiss my parents and my closest friends on the lips… To all the haters.. If you don’t like it, just don’t comment…the “anonimity” of the internet doesn’t give you a permission to be rude to a celebrity that decides to share part of his/her personal life with you’.